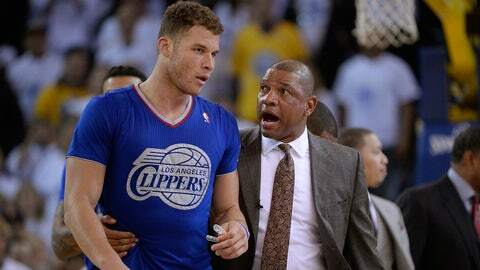 Clippers head coach Doc Rivers has no plans of trading All-Star power forward Blake Grififn. 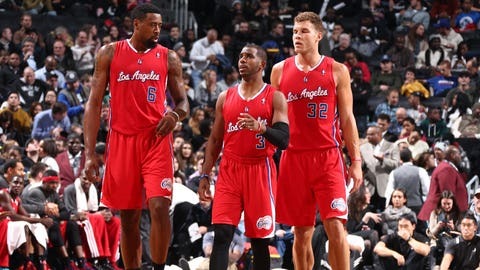 Clippers Coach Doc Rivers said an ESPN report that the organization has had internal discussions about possibly trading Blake Griffin to the New York Knicks for Carmelo Anthony was "so stupid." Rivers clearly was upset about the report, and about being asked about it by reporters before the Clippers played the San Antonio Spurs on Saturday night. "It really is, it’s just so stupid," Rivers said again. "You know how I rarely read stuff, but someone told me read that, and it didn’t say anything about us. Anyway, it’s just stupid. "My whole issue with any of that . . . is that that network [ESPN] to me reports a story that they created and then they do reports on it for the next two days, on a story that they created. But it’s stupid." The ESPN report, which was attributed to unidentified league sources, said the Knicks have discussed proposing an Anthony-for-Griffin trade with the Clippers, and that Clippers management has discussed such a deal internally. But it said the teams have not spoken to each other about a possible trade. With Chris Paul expected to be out three to five weeks because of a separated right shoulder suffered Friday night in Dallas, Griffin really becomes to the Clippers’ most important player. Griffin leads the Clippers in scoring (22.1) and minutes played (36.6) and he is second in rebounding (10.6) and assists (3.1). He also is making a career-best 70.4 percent of his free throws, as well as shooting 52.1 percent from the field.